War’s reports deluge us every hour. Why should we read the “old news” of Christian history? In a time of war, everything seems to hinge on The Now. But more than ever, it is really a time when we must be in touch with our history—especially, our sacred history. No, this is not a plug for our magazine. You can read Christian history in many other places: Biographies. Histories of Western Civilization (e.g. Jacques Barzun’s From Dawn to Decadence). Novels (e.g. Harriet Beecher Stowe’s Uncle Tom’s Cabin). You can even “read” Christian history on the walls of museums, like the Art Institute of Chicago. Because Christian history is everywhere in our culture. No matter what your religious background (or lack thereof), you just can’t understand the modern, Western world—including its wars—unless you know your Christian history! Because life is too short to learn by experience. To echo Lewis’s words that we’ve just heard, “the scholar has lived in many times.” What a rich way to grow in wisdom! Though experience can be the best teacher for some things, for others it does not take us far at all. Job’s friend, Bildad the Shuhite, had it right (for once): “Ask the former generations and find out what their fathers learned, for we were born only yesterday and know nothing, and our days on earth are but a shadow. Will they not instruct you and tell you? Will they not bring forth words from their understanding?” (Job 8:8-10). Because whatever question is on your mind, someone smarter than you has already seen it clearer, thought about it longer, and expressed it better. Why reinvent the wheel? Also falling under this heading: There are no new heresies—only old ones in new clothes. And again, they’ve all been answered with more wisdom and erudition than we’ll ever be able to muster. Because the deeper our roots, the higher we grow. Believers are all part of a “Dead Christians Society.” We have far more brothers and sisters in the faith who are no longer around than we do contemporary saints. Lets get to know them. And while we slog it out on earth as members of the Church Militant, the Church Triumphant is pulling for us from heaven. 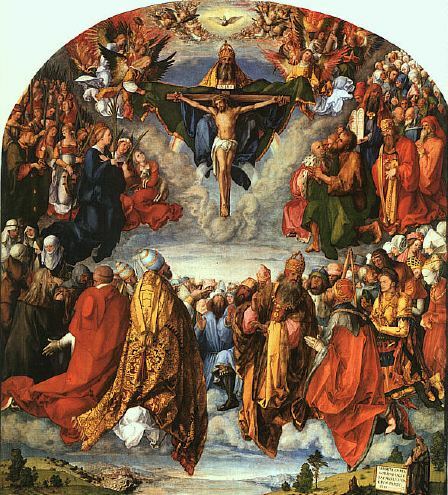 What a shame to lose a sense of the communion of saints—the “cloud of witnesses” urging us to go on. The heroism, tears, toil, and triumphs of “Dead Christians” can inspire the living. Because reading Christian history is a great way to meet fascinating people and hear dramatic, colorful stories. History is all about people. Memorable people. As Ralph Waldo Emerson once put it, “There is properly no history, only biography.” And Thomas Carlyle added, “Biography is the most universally pleasant and profitable of all reading.” Those Victorians had it right—and nothing sizzles like the stories of the saints! From the little we may have heard about some of those differences, we’ve probably already put some of our brothers and sisters in a box marked: “Weird.” But in the words of historian Jacques Barzun, reading history “tempers absolute partisanship by showing how few monsters of error there have been.” The more we read about other Christians, the more we get to walk in their shoes and gain respect for their approaches to the faith. That’s a good thing, because the church today is a body with a wide (and sometimes wild!) variety of members. Knowing more about the past, we gain insight into the practices and problems of other Christians in the present. We may become less critical of others—and even more aware of our own shortcomings and limited perspectives. Because reading Christian history shows us how we got where we are today. Where did all those denominations come from? How did the distinctive beliefs and practices of my own church develop? What’s the big deal over Calvinism and Arminianism? We all are members of local church bodies (or, as my friend Allan Poole likes to say, “outposts of the Kingdom”). Wherever we worship, when we step out of the church doors we still need to “be the church”—salt, light, Different. A powerful way to prepare ourselves for that mission is to read how Christians of the past have sowed the Gospel into their cultures. Lutheran theologian Joseph Sittler puts it like this. The church, through studying its history, “looks inside herself,” into her own “nature and mission.” When she does this, “she is less likely to take her cues from the business community, the corporation, or the market place” (see Reason #2). Like the wine at the Cana wedding feast, the best reason has been saved for last: We should read Christian history because Christianity is a historical religion, based on a historical person and the words of two “Testaments” full of historical accounts. Nineteenth-century liberal theologians liked to talk about the “essence of Christianity”—usually little more than “the Fatherhood of God and the brotherhood of man”—that needed to be extricated from the centuries of errant doctrines and practices of a church that never seemed to get it right. (The problem with this approach, as a wit once observed, is that those nineteenth-century liberals, when they read Christian history, looked down the well of 19 centuries and saw their own faces at the bottom.) But there is no “essence” that is not clothed in history. Christianity is all about the Incarnation of God’s second person as a first-century Jew from Nazareth. And naturally, then, the New Testament is no philosophical book of abstract teachings. It is a narrative of a life, a sacrifice, a resurrection—played out on the stage of history. And the Book of Acts and the Letters, following the model of the Old Testament’s “historic” books, just picks up the story from Easter. When you read Christian history, you’re paging through the 29th chapter of Acts. So next time you’re tempted to tune in for the 200th update on the war in Iraq, think about a few of these reasons, or fill in your own. Then start reading Christian history—or should I say, biography? The “cloud of witnesses” awaits. This entry was posted in Medieval Wisdom for Modern Protestants, Patron Saints for Postmoderns, Resources for Radical Living and tagged biography, C S Lewis, Christian history, church history, culture, denominations, heresy, martyrs, war. Bookmark the permalink. Chris, how wonderful for me to find your blog. Your top ten lists are helpful and persuasive. Keep up the good work – too many blogs do not introduce readers to their field – they just right for their colleagues. Thanks for the kind words, Russ. Good to connect with you on Facebook. May God bless you in your vocational discernment process.